Jim Shooter, former head of Marvel and Valiant, also started a comics company called Defiant Comics back in the 90s. I liked a couple of their comics (they only made a few before going out of business), including their initial ongoing series, called "Warriors of Plasm." David Lapham drew it. We also, when we first started out, were sued by Marvel Comics. When we announced Plasm, they claimed they had a character that that infringed upon. What they actually had was a name registered in the U.K. trademark with intent to use. They ended up suing us. We ended up fighting that out in court. It cost us over $300,000 in court. We won, hands down. The judge scolded them at the them [sic], because he knew they were just using it as a business weapon. Trying to use the court to squelch a competitor. Especially since, to them, I was a dangerous competitor. The last time I had started a company, I had taken a chunk out of their market share. They lost and lost big. But when you're a small company and somebody bleeds $300,000 out of you -- also 120 hours of my time, a similar amount of time for Winston [Fowlkes] who was the publisher. A spurious trademark infringement lawsuit against us by Marvel helped speed our demise. They lost, but it cost us over $300,000 to defend ourselves. Bleeding that much money out of a small start-up is lethal. Their true mission was accomplished. 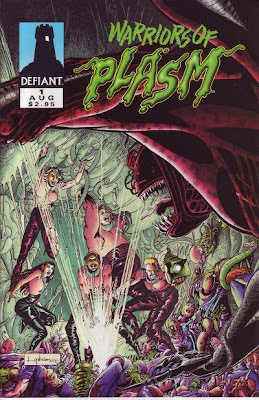 Here's my own comment on this situation: Jim Shooter should not blame Marvel for killing Defiant; he should blame his own lawyers. Any lawyer who allows a case to go to trial where, even if he or she wins, the litigation costs would run the client out of business is not a good lawyer, no matter how skilled he or she is at arguing in court.